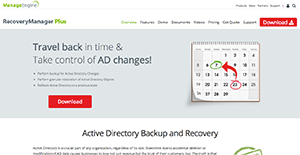 ManageEngine RecoveryManager is a web-based Active Directory (AD) backup and restoration software that lets users back up all your AD information as well as retrieve deleted objects. In addition, it provides users with the versatility they need to get back only specific type of objects or just specific attributes of desired objects. A very popular recovery and backup option, ManageEngine RecoveryManager Plus is an ideal platform for businesses of all sizes. Among the capabilities it brings to the table are granular recovery, scheduled backups, change management, and others. RecoveryManager Plus gives users the undo functionality, which enables them to undo modifications and moves they made. The system also boasts version management features, such as version-level backup, version comparison, granular restore, version tracking, and comprehensive viewing. Other essential offerings include recovery management, extensive search options, and restart-free recovery. How does ManageEngine RecoveryManager Plus benefit your business? For one, this particular system allows users to backup and restore user objects either partially or completely. Users can also track and restore definitive attribute value modifications made to user objects. The application is capable of taking back users to a specific point of time in the past and undo all the tweaks and changes made and implemented after that point. The system is capable of backing up both security and distribution groups, as well as revert or roll back to a certain backed-up state. ManageEngine RecoveryManager Plus is also built to backup and restore all group policy objects found in your domain. The system enables users to follow every change implemented to GPOs and undo individual changes made to them that users deem undesirable. ManageEngine RecoveryManager Plus can also be used to backup OUs and recover erased OUs with just a single click. Users can even recover complete OU tree when retrieving an OU that has already been deleted. For users who want to restore group memberships, ManageEngine RecoveryManager simplifies the process. Once a deleted user account is restored to the domain, all group membership information pertaining to the said user will be totally restored as well. In turn, the user will again be made a member of all security and distribution groups of which the user was a member. The system also offers a set of features that allows users to monitor and evaluate individual tweaks made to mailbox users, distribution groups, mail users, and mail contacts. You can also perform scheduled and incremental backups of Exchange-related attributes and even recover deleted Exchange objects and revert attribute level changes, either partially or completely. It's essential to keep in mind that hardly any software in the IT Management Software category is an ideal solution able to fulfill all the goals of different business types, sizes and industries. It may be a good idea to read a few ManageEngine RecoveryManager reviews first as specific solutions may excel just in a really narrow set of applications or be created with a very specific type of industry in mind. Others can function with a goal of being simple and intuitive and therefore lack complicated functionalities needed by more experienced users. There are also software that cater to a wide group of customers and give you a complex feature base, but this frequently comes at a more significant price of such a solution. Make sure you're aware of your requirements so that you purchase a solution that offers exactly the elements you look for. How Much Does ManageEngine RecoveryManager Cost? We realize that when you make a decision to buy IT Management Software it’s important not only to see how experts evaluate it in their reviews, but also to find out if the real people and companies that buy it are actually satisfied with the product. That’s why we’ve created our behavior-based Customer Satisfaction Algorithm™ that gathers customer reviews, comments and ManageEngine RecoveryManager reviews across a wide range of social media sites. The data is then presented in an easy to digest form showing how many people had positive and negative experience with ManageEngine RecoveryManager. With that information at hand you should be equipped to make an informed buying decision that you won’t regret. What are ManageEngine RecoveryManager pricing details? What integrations are available for ManageEngine RecoveryManager? If you need more information about ManageEngine RecoveryManager or you simply have a question let us know what you need and we’ll forward your request directly to the vendor.